Thanks to an announcement today from the Rock 'n' Roll New Orleans Marathon and 1/2 Marathon, area runners will have something more to consider when deciding between running the half and full distance on January 25th. NEW for 2015: All FULL marathon finishers will receive an exclusive Rock ‘n’ Roll New Orleans Marathon Finisher’s jacket ... at NO additional cost! This is in addition to the participant shirt, finisher's medal, and other amenities provided to runners on race day. 1) Click HERE to register for the Rock 'n' Roll New Orleans Marathon. 3) Choose “Full Marathon” as your race distance. 6) Pick up your jacket at the Rock ‘n’ Roll tent after their race with your bib and finisher’s medal! All full marathon finishers will receive this jacket regardless of when they registered, even if they registered before today. Runners just have to finish the 26.2 mile run to receive it, and have their bib and finisher’s medal when they pick it up. The jacket will not be shipped, as it will only be available to finishers on race day. Note, if a person drops down from the full marathon to a shorter distance, they will not receive the jacket. It is for FULL marathon FINISHERS only. Race officials will be checking bib numbers with their timing system to confirm completion of the full marathon before receiving the jacket. The official design of the full marathon finisher's jacket will be unveiled at a later date; as the image above is a sample. However, if it's like the one shown in this graphic, I was given one by a friend to celebrate my 2013 finish. It is the MOST comfortable pullover I own, and wear it often. Click HERE to see the official announcement from the Rock 'n' Roll New Orleans Marathon and 1/2 Marathon. 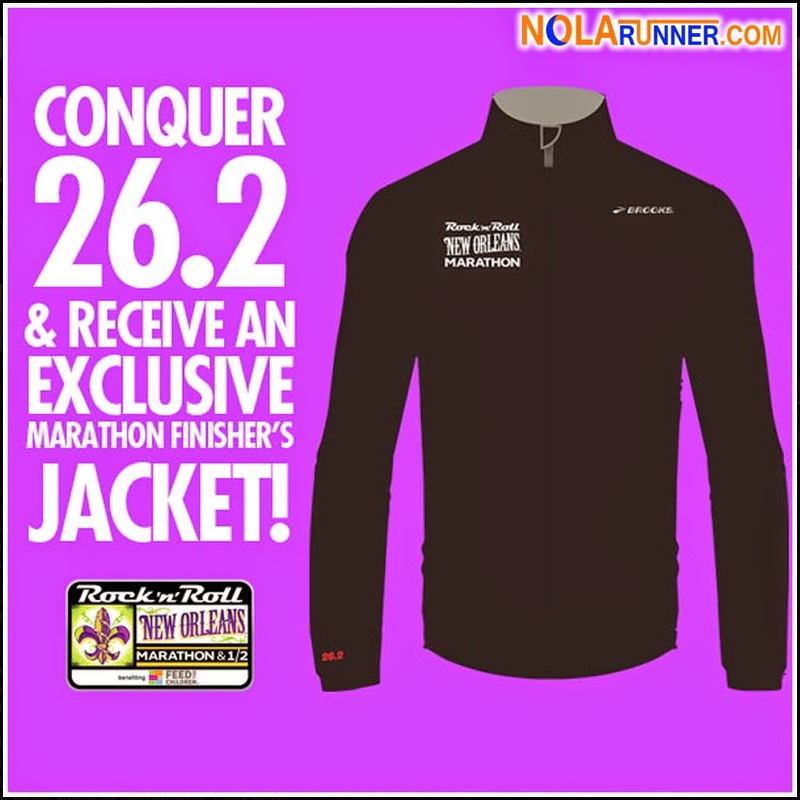 *Must complete the full marathon on race day in order to receive the Rock ‘n’ Roll NOLA Marathon Finisher’s Jacket.